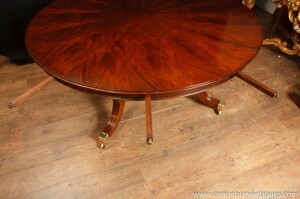 At Canonbury Antiques we carry a number of marvellous Jupes extending dining tables. Jupes tables are great as they are round dining tables that can be extended out via an ingeneous extra ring of concentric leaves. 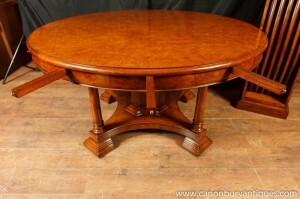 So you can make the table bigger if you are entertaining for a large dinner party. Jupes tables are easy to set up and dismantle and we have them in walnut and mahogany. If you can’t find the right piece get in touch and we will source it for you. We specialise in matching dining chairs to tables for that perfect high end dining set up, particulary mahogany and walnut dining sets. If you like anything you see on the website including the Jupes tables then please let us know and we can arrange a viewing at our Canonbury Antiques Hertfordshire showroom. We are open on Saturday’s on the weekend and this is one of our most popular days. I guess as our customers are not working and can take time to fully browse and appreciate the Alladin’s Cave that is our showroom! We are open 10am to 5pm on Saturday’s so please let us know if you’d like to come by. We are only 25 minutes north of London and are conveniently located right near where the A1 meets the M25. We are also accessible via train and the nearest station – Potters Bar – is just 15 minutes north of Kings Cross in central London. There is a minicab firm right outside the station or we can pick you up.